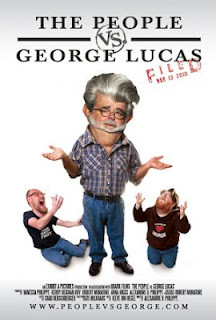 THE PEOPLE VS GEORGE LUCAS plays like a slick version of a YouTube fan doc. Alexandre O Philippe basically interviews a bunch of Star Wars fans and gives them a kind of group therapy space to discuss their love of the original trilogy and their sense of betrayal both at the changes that George Lucas has made to it, and to the travesty of the prequels. For me, this was a movie that perfectly articulated my own love-hate relationship with Lucas and made me feel less alone in my frustration. Along the way it explores interesting issues. The first is the tragic figure of Lucas - a man trapped in a prison of his own making. The irony of the indie film-maker who has himself become the guardian of a capitalist franchise. Francis Ford Coppola is particularly articulate on the idea that George Lucas never made the brilliant artistic films he could've done because he was trapped by the Star Wars monster. The second is the nature of "art" and who owns it. The second big issue is whether the fans right to feel that because they have invested so much into the original trilogy, that Lucas is obliged to respect their feelings and not make any changes? Or is Lucas, as owner of the film rights, perfectly at liberty to do as he pleases? Indeed, in an age of the internet, when geeks can come together in real time, creating a hysterical response to a cultural work, critiquing every line, are we just setting ourselves up for a fall? I can see this on the current fan forums for George R R Martin's A Song of Ice and Fire. The hype is so great, any new novel is almost guaranteed to be a disappointment. And the emotional investment is so great, even the slightest change in the HBO TV show causes outrage. And what about all the collaborators who worked on those original films? Do the special effects guys whose effects have now been replaced with CGI been robbed of their contribution? In other words, how far is the director really the auteur who can play God with a collaborative art-form? Lucas clearly things he is God, the Creator, with the right to do as he pleases. But have generations of film critics created a false perception of just how important the director truly is? Is the director as deluded as the fans? THE PEOPLE VS GEORGE LUCAS is thought-provoking, entertaining, and gives you a great sense of camaraderie. It's well worth a watch, even if you're not a Star Wars fan, because it describes so clearly modern fan culture. And for the record, HAN SHOT FIRST! THE PEOPLE VS GEORGE LUCAS played SXSW 2010 and was released in 2011 in the USA and on YouTube. It is available to rent and own.